The Panama Declaration is read out by two of the IACC Young Journalists. More than 1,600 people from around 130 countries gathered in Panama City, Panama, with one common call: the time for Justice, Equity, Security, and Trust is now. 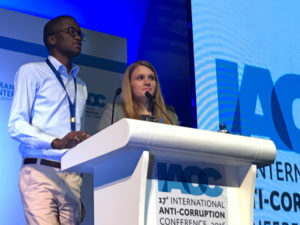 When the International Anti-Corruption Conference closed in Malaysia in 2015, the rallying cry was “Zero Tolerance for Impunity”, for corruption at all levels: from petty corruption to grand corruption, for those who steal national wealth, enable organised crime to flourish, and provide secrecy for tax evaders and hiding for the funding of terrorism. Now it is time for justice. As the world changes, corruption mutates as well. We all know that it proliferates thanks to a web of corrupt companies and trusts, and is crosscutting. More and more it is deeply embedded in politics and fuels corruption, piracy, human trafficking, drug trafficking, and environmental destruction. Grand corruption harms individuals and societies at large and must be seen as a global threat. We acknowledge how the ever-increasing linkages between corruption, wildlife crime, organised crime, and illicit financial flows severely damage societies and should become a priority for the anti-corruption movement. It is time for us to grow and strengthen global partnerships and other networks, North and South, to stop transnational illicit financial flows so as to enhance international cooperation in fighting money laundering, advocate beneficial ownership transparency, and stop the enablers. Governments should partner with international financial institutions by using the robust sanction system to ensure that public servants who engage in corruption do not go free. It is time for equity: corruption deepens inequality worldwide and the consciousness and anger of the people is becoming more and more apparent. In many countries, as they make the link between corruption and inequality, the people have taken to the streets as has been seen in Iceland, Brazil, Guatemala, Moldova, Turkey, Ukraine, South Korea, and several other countries. In other cases this new consciousness has been reflected in elections. It is time for security: in many countries the space for civil society is shrinking. Journalists, filmmakers, whistleblowers, all activists are increasingly put in jail for speaking against corruption. Laws are enacted to make it difficult for NGOs to function, for the media to be gagged, and for judges and prosecutors to be weakened. It is time for trust. A close partnership between the private sector, civil society and government can shape our collective action. Our objective is to bring about change and build trust, with transparency and integrity. In Panama, we reflected on the critical role the media in general and especially investigative journalists have played this year, and how fundamental their role will continue to be to shine a light on the corrupt and to demand justice. The time for action is now. We must partner with all anti-corruption champions and well-minded business. We came together to define where our work will be most effective and raise our voices against the rise of autocracy around the world that threatens to limit freedoms. Together we will strengthen our web of anti-corruption activists. Together, the public sector, business and civil society will hold the corrupt to account. It is Time for Justice, Equity, Security, and Trust. We are grateful to the government and people of Panama and we look forward to continuing our cooperation to ensure that impunity and grand corruption is no longer tolerated. We thank the people of Denmark for welcoming the global anti corruption movement and for hosting the 18th IACC in Copenhagen in 2018.